Ok, so I have been carried away lately with fondant cakes, but I'm back to my, sort of, comfort zone. I was, at first, thinking of making some kind of chocolate banana mousse concoction dessert; however, as I was about to purchase the bananas I saw a glowing yellow bargain... mangoes! Mangoes here in Korea are really pricey, like around $3.50 for two pieces, and being a cheapskate, I'm not willing to pay for it. So when I saw the lovely offer on the reduced rack of the fruit section... I thought, "I've got to have it" - $1 for two pieces, a tad over riped, but perfectly sweet for the dessert I had in mind! This is what I have come up with - mango mousse cake. So it's a basic mango mousse that is semi-encased with sponge cake. I had a little fun with the sponge cake by marbling some fun tropical colors that still screams 'mango' into it. For a simple finish, I just made a small flower out of sliced mangoes. This mousse cake is really really light and refreshing; absolutely perfect to finish off a filling meal. There are two main components for this cake: the sponge cake and the mango mousse. 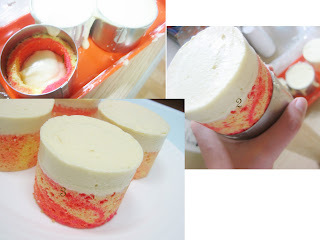 Make a >Basic Sponge Cake Recipe<, then divide the batter into the amount of different colors you want in your cake then add food coloring in the respective batters. 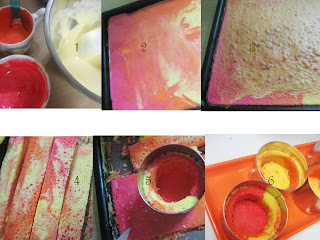 So in my case, three - pink, orange and yellow; note that I have more yellow than pink and orange because I wanted yellow to be the dominant color in the marbled sponge. I poured the pink, orange and yellow sponge cake batter on a stripe vertical pattern on a lined square pan. Then, I used my spatula to swirl around the batter to create the marbling effect. After baking, you would notice that the top of the sponge turns into golden brown, but don't worry. Simply use your fingers and gently rub it off, then you will see the lovely marble pattern you have created. Slice four strips from the sponge cake, this would be used to ring around the inside of your mold. Make sure to measure how thick you want your strips to be. I had mine measured two-thirds of the height of my mold. Place the sponge strips inside each mold. Cut out circles from the remaining sponge cake to serve as base of your cake. I used the sponge-lined mold to use as a guide for the size of my circle base. Now you have your sponge case ready to be filled with mousse. Cover the molds with cling, and put them in the fridge while you make your mousse. I used to think making mousse is the most complicated thing ever, because when you read recipes of it, it's usually very long. As I make mousse desserts more often, it occurred to me that it's actually quite simple. Like there would be different ratios or mix of ingredients in different recipes as well as different procedures, but when you come down to it, it has almost like a 'generic' way of making a mousse. You just need a lot of mise en place (having all the ingredients needed prepared and set in place) to do. I have made a mini documentary of how I made my mango mousse, and hopefully I can translate to you how I perceive making a mousse. For me, mousse is a four part dessert: part 1 - whip yolks and sugar, part 2 - add the flavour of your choice and gelatin (if your using), part 3 - fold in the whipped egg whites and part 4 - fold in the whipped cream; et voila! It is simple when you look at it that way right? Anyway, here's a more detailed guide. For this mango mousse, I opted not to use gelatin. Mise en place. 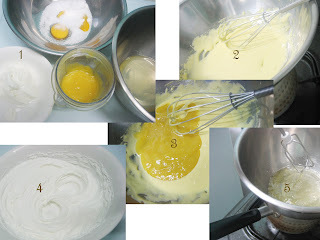 In picture number 1 there are four bowls, clockwise from top bowl, 2 egg yolks with 34 g sugar, 2 egg whites with 15 g of sugar, 150 g mango puree and 90 ml whipping cream. Now you're ready to whip and fold, whip and fold, whip and fold! Place everything aside on room temperature except for the cream, put that in the fridge. Get the bowl with the egg yolks and sugar, and place it on top of simmering water. Whip until thick and light in color (ribbon stage). Mix in the mango puree. If you're using gelatin, this is the part where you add it in as well. Remove from simmering water. Set aside. Whip the cream, and return it back to the fridge. The reason why I whip the cream before the egg whites is because egg whites deflate faster, so I want to whip the whites as close as possible to when I will use it. Stir the egg whites with sugar on top of simmering water until the egg whites are warm to touch. Remove from simmering water. Fold a third of the egg whites into the egg yolk-mango puree mixture. The purpose of this step is to lighten the yolk mixture to give it a closer consistency to the rest of the egg whites. Fold in the rest of the egg whites. Notice I use a whisk to fold, this is just my preference; I find that it incorporates mixtures faster than using spatula. 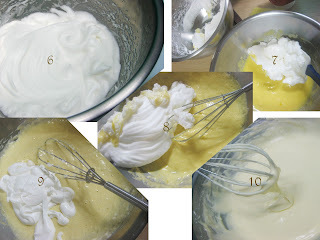 Fold in the whipped whipping cream. Now that the mousse has been made, it's now time to fill the sponge cakes. Fill the sponge-lined molds with the mango mousse; level the mousse to the top of the mold using an offset spatula to give a smooth finish. (Try to fill the molds neatly, don't be messy like me..) Cover in cling film, and let it chill overnight or until it's set. Once it's set, Take of the cling film. One by one push the bottom of the cake gently to unmold. I used the help of my rolling pin to give a flat support in pushing up my cakes. Voila, the cake can be served as it is or you may add finishing touches. These dainty creations really made me happy. It looked good and definitely tasted good! I'm in bliss to have found those mangoes. I've never really yearned for mangoes even if it is a very common fruit from where I grew up, but I guess not having it readily available made me miss them. I got some left over mousse, so I just filled them on a wine glass and topped it off with a flower made from the rest of the mango slices.